1. Live Chat or Call one of our Viking Part Pros at 1-888-988-4546. We are here M-F 8am to 7pm Central Time. 2. If you can't reach us or you are on the website after business hours, on the check-out page, click on Review. I have entered BOTH Model & Serial#. We guarantee the right part if you use our assistance. To use the diagrams below, you'll need your model number and serial number. Here's how to find them. For many models, the parts have changed depending on the date of manufacture. 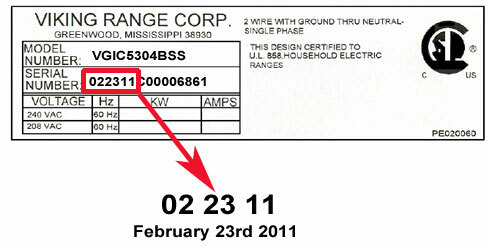 Be sure to check that date before clicking on a model number. Here's how to identify the manufacture date.